Much like the week before, this has been a funny old reading week for me. Although I didn't technically read an entire book - from start to finish - I managed to finish up three books, tying up the loose ends on books that had a bookmark part way through them. As I mentioned in last week's 'It's Monday' post, I wanted to complete reading Disclaimer by Renee Knight, a book that picked me up from an almost slump. I checked that one off my list. After that I hoped to start Miss Peregrine's Peculiar Children, the entire series, but instead of delving into that I decided all the half read books I had sitting around needed completing first. I say all, it was actually only two. Well, four because I have two collections of short stories sitting around too but I just read those intermittently. So, up first was a nonfiction title that I had been dipping in and out of - Daily Rituals: How Artists Work by Mason Currey - followed by the illustrated edition of Harry Potter and the Philosopher's Stone. Although I didn't read what I expected to, I had a successful reading week and it feels good to not having random half read books sitting about. So, because of that outcome, my upcoming week looks much the same as last week's 'It's Monday!' 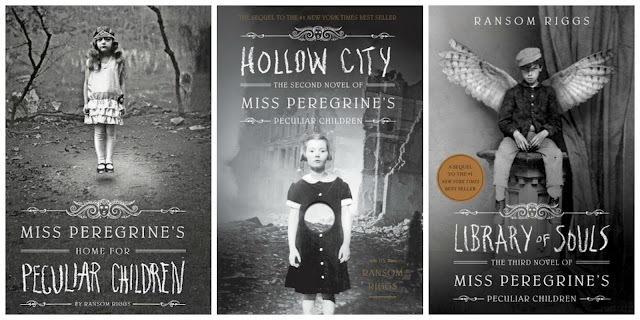 post, with Miss Peregrine's Home for Peculiar Children, as well as Hollow City and Library of Souls being on the reading docket for the week. I don't see all three of those being read this week, but I would like to make a good dent in them. In other bookish news... I signed up for the First Book Of The Year: 2016 linky hosted by Sheila of Book Journey. Every year that I've been book blogging (under other domains), I think it will be two years with this being my third, I've linked up. I love the concept behind the linky because like Sheila, I also put a great deal of thought in to the book I'll see the new year in with, and hope it makes a good starting point for the year that follows. As of right now I'm not currently 100% sure what title that will be, but I do have an idea and I may well return to a tried and true favourite author; playing it safe. I love finishing several books I've started and then making my list of what I want to read next. This will be my third year signing up to Fist Book of the Year too! So many people have signed up to Sheila's linky - I can't wait to see what everyone is reading in a few weeks! Looking forward to First Book, too... no idea what it will be yet! Have a good week. It's so fun deciding though - I hope you pick a good 'un. Thanks for visiting my blog, and I'm glad you were able to finish up some books you'd started. I am also looking forward to the First Book of the Year event, and ordered the sequel to the one I chose for 2015. Enjoy your week! What a good route to go down with the first book of the year... I'm leaning towards a favourite author of mine who I've turned to each year, we shall see. I'm signed up for First Book as well. Can't wait to see what everyone is reading in 2016. First Book of the Year is one my favourite linkys - it's always interesting seeing what everyone picks. I've never read the Peregrine series, though I have heard wonderful things about them. They look delightfully creepy. I hope you get a good amount read and that you enjoy them. I had 3 books on my to-read slate this week as well, but I don't know if I'll get even one of them read, what with it being finals week and all. 'Delightfully creepy' is a good expression for them. Ah, it sounds like you have a lot on your plate this week - I hope you're able to get some reading in! Oh, I see why you skip it... I would say it's the first book you read going in to the New Year though. Me too - it has definitely given me a clearer mind going in to the week. I was all over the show for a little while there! Such a satisfying feeling to finish off those half-read books! Enjoy the new series you're diving into! Thank you, Julie - it is a satisfying feeling, you're quite right! I love Sheila's First Book of The Year fun. Glad you finished off your books. It's always fun! I hope you have a great week too! A tried and true author seems like a good way to start the new year. :) Good luck with your choices. Sounds like fun. I'll keep an eye out for if you review Disclaimer, as I do think that one sounds unique. It's kind of a safe option, going with a tried and true author, but then you know you're in for a treat. My review for Disclaimer will be up on Friday... It was tough one to write, but a book worth checking out. You had a great week. It feels so good to finish and start new books! Ohhh I should really think about signing up for Sheila's first book event. I'd like to start the year out with a bang! :D I like your idea of reading a favorite, that's a sure way to start 2016 out on a good note. You definitely should - it's so fun participating and getting involved with a lot of the book community. Starting the new year with a bang is my hope too! Have a great week! Sheila's done this before? Where have I been? Goodness. I'm really interested in this Daily Rituals book. I'm going to go check it out! Haha - with all the linkys and challenges around the community it is easy to miss some! You should! I think it's a book that could easily be overlooked when it comes to non fiction but one that is insightful and even motivating. Choosing the book is half the fun of participating!! I look forward to seeing what you pick. Ah, I hope you enjoy it whenever you're able to get round to it. I own a copy of Hollow City but haven't read it yet - I look forward to receiving Library of Souls for Christmas - love the Miss Peregrine love here. I truly enjoyed that novel last year. :) Did you know that there is a graphic novel adaptation of the first book? Since going back and rereading the first in order to continue with the series, I've realised how much I enjoyed it first time round. Loving it! I had no idea there was a graphic novel! I don't think I've ever really thought about what book I'm reading first in the new year before. That sounds like fun, I may need to sign up, too! I'm glad you were able to finish up all the books you had started. It's nice to start fresh with something new. Enjoy! You should sign up, Brandie! I needed the clean slate; I feel like I'm getting back on track with my reading! I laughed at your bluntness of calling these covers creepy. I guess I was trying to be polite? I'm joining in too for First Book of the Year. This will be my third year I think as I faintly recall the first time I didn't have myself in the picture and last year I did. I'm not sure what will be my first book. Still pondering. The first two years I really knew what I wanted to read. This year, I'm not so sure. Oh, they are creepy. A good creepy though. The kind of creepy that I don't read these books before bed. Haha! I'm with you, I'm not too sure what I want to read, but I'm leaning towards going down a safe reading route because I want it to be a good 'un, y'know. With the First Book of the Year linky I've never actually sent my picture... I selected maybe this year, we shall see. Haha! I love seeing everyone else's!